Today is our Anniversary and I wanted to share a little of what I did yesterday. but I'm only showing one shelf of my makeover. and decided it needed to be the focal point for my creative project. I love old documents, and the graphics and fonts on this are just beautiful. It makes me a little sad to think this wonderful keepsake found it's way to a flea market. I'm showing the rest of my re-do. I can't wait to see the rest, Debra! Happy Anniversary! Happy Happy Anniversary!!! 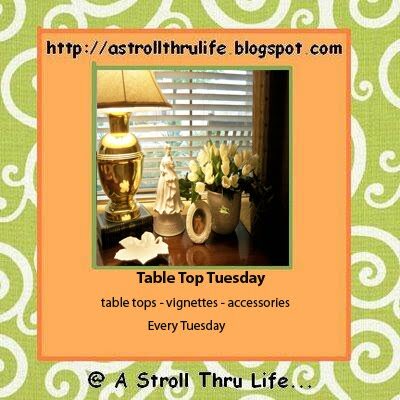 I love your tablescape! The certificate is gorgeous! Absolutely LoVe Your New Blog Header!!! ~ Great display as we approach January... AND "HaPPY ANNIVERSARY"... My dear Aunt Loretta's words of wisdom for a life long marriage: The 3 -C's... COMMUNICATE, CONSIDER, COMPROMISE... YOU must be doing just that!!! Happy Anniversary my sweet friend. I hope you have a great celebration. Love old the certificate and clock. Here's wishing you many more great years together!! Love that old marriage document, you find the coolest things!!!!! Beautiful! They sure don't make 'em like that now. I love that it serves as the focal on your sideboard, and can't wait to see the rest. Congratulations Debra, how fortunate you two are to have found each other. Wishing you a wonderful day together and always. Your display is beautiful, love the graphics too! 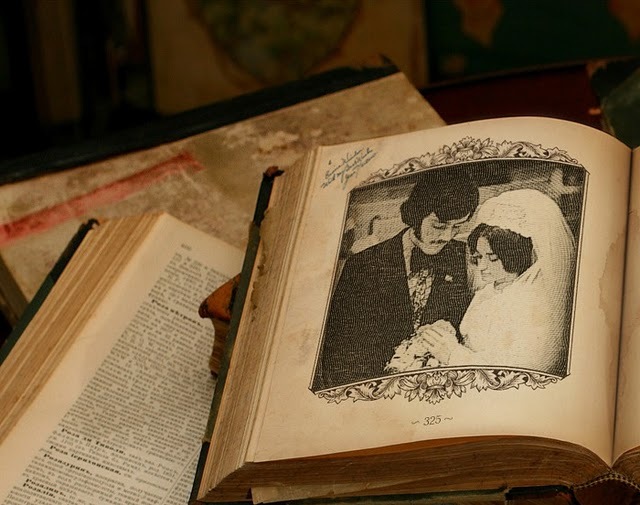 I absolutely love the wedding certificate and how you worked in this piece of art into your vignette! Congrats on your anniversay...ain't it sweet? and God is so good to have carried you this far! Congratulations sweet, I hope your day is happy, and full of love. 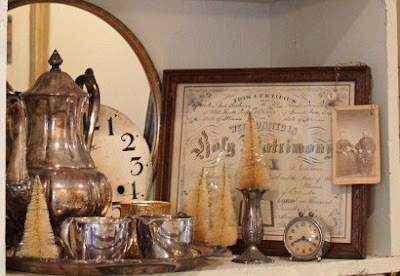 The beautifull vignette, looks so fantastic and very cosy,Debra-love the silver and trees together and the old documents. Happy Anniversary, Debra! Love that old marriage certificate. When did they stop gettin' so fancy? Happy Anniversary! A Christmas wedding...how lovely! Congratulations to you and Mr CG! I Love the certificate and the photgraph of your special day. Happy Anniversary Debra. I really love the old wedding certificate and your vingette. So pretty. What an incredibly unusual find, Debra. You're right...it is kind of sad. But it certainly makes you wonder how it got there.... Happy Anniversary to you, dearie! Cheers! Happy Anniversery Debra ! Ain't love grand ? It's a joy to know of people celebrating long marriages. Congratulations Debra and hubby. Love the old certificate ~ can't wait for the rest (: Blessings and Happy New Year. Congrats, Debra! We were married Nov 25th of that year and I think your husband and mine wore the same tux and hairstyle LOL! Love your pretty shelf vignette! Happy Anniversary Debra! I hope it was wonderful! Hi Sweet Debra! Happy Anniversary!! I love the Certificate! Ackkkkk!! And your photos are just lovely as always! Happy Anniversary and Happy (Early) New Year! Hi Debra, What a wonderful vignette for your sideboard. I love the marriage certificate and the clock face. Happy Anniversary! Debra, this is a beautiful post. Happy Anniversary to you and your husband. I agree, it is sad to think that someone's marriage certificate ended up at a flea market. Glad you rescued it and are honoring it. What a romantic old gift certificate. Happy Anniversary! The sacrament of matrimony is really sacred especially to couples who decided to seal and to push through the relationship they have to the next level. Actually, I know a west palm beach divorce lawyer who also have the same sentiment when it comes to marriage, that's why if possible he urges the couple seeking for his service to fix things between the couple to save the relationship. What a lovely old marriage document you got there! I remember when I went to my tax fraud solicitors house and I found their old marriage document hanged in their living room. He told me that marriage makes you and you partner your relationship go stronger even though you got so many problems in your life, you should face it together.